That’s strange. Though my reviews/ratings haven’t changed in weeks. For some reason, new reviews aren’t being counted in the top rating on the page. Maybe they’re still revamping the system. I see that your paperback has 112 ratings compared to 64 reviews for Vol 1. It looks like all 64 reviews are factoring into the review average. In your case, the 112 ratings on the paperback yield the same average (in which case, those ratings don’t seem to make much difference except increasing the overall total of reviews/ratings). Then maybe it’s only paperback. My 3rd and 4th books aren’t even attached to the paperbacks for some reason. I thought they did it automatically like the other two. They ordinarily do, if the title fields, subtitle fields, and author fields have the exact same spelling and punctuation. But if they don’t link automatically within a few days, just complete the form at the KDP help pages > Contact Us option. I don’t see how people are just leaving ratings, since when you click on the amount of stars you want to rate it, Amazon says you’re required to write a review. If you hit submit, it won’t let it go until you write the required word amount. Someone needs to ask Amazon about this, because it’s really weird. Login to Amazon. Click where it says your name and Your Account. Choose Your Orders. Find one of your orders and click Write a Product Review. It gives me a list of purchases that I can rate from 1 to 5 stars. I rated a couple of items (not books) as 5 stars to see what would happen. It expanded to show what looks like the usual review form. When I click Submit, it tells me that my review is incomplete. However, then I went to ___’s Amazon.com (fill in the blank with your name) which appears at the top left of Amazon’s home page. Click the Improve Your Recommendations tab. There I see a list of products that I can simply rate. The few items that I rated 5 stars are already rated here, so even though I thought I hadn’t completed the rating process, apparently I had. It looks like you can rate products from the recommendations page. I would bet a lot of money these ratings are coming from Goodreads. Amazon has to get something out of buying Goodreads, and everyone knows books are ranked much lower at GR than they are at Amazon. 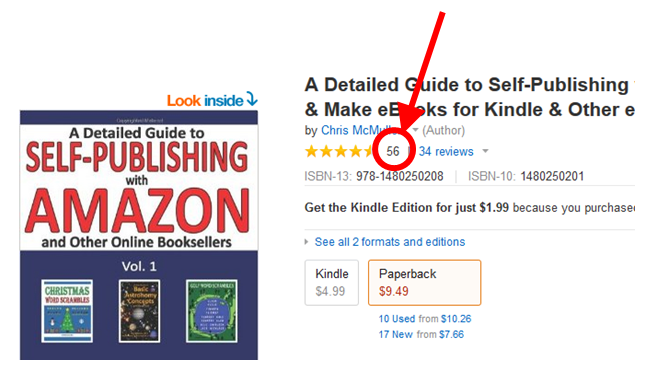 Perhaps Goodreads is where Amazon received the inspiration to publicize the ratings. The ratings were left on Amazon (as I have many fewer at Goodreads than can account for the difference). Amazon transferring ratings and reviews from Goodreads is a scary thought… I don’t see that happening, but you never know. Valerie, maybe you’re right about Goodreads. You might want to see Judy’s comment (she received an email from Amazon about Goodreads). I received an update today on my Kindle, telling me I now can access my lists of books from my Goodreads and link it to my Kindle. So yes, I think it may be from Goodreads. Hmm, mine aren’t updated yet for my paperbacks. I probably need to log into my Author Central and update things anyway. Just noticed this today. I now have 373 ratings on the paperback of my novel, FRY, when I only have 170 reviews. The number of ratings I have on Goodreads does not make up the difference. Interesting! Also, it only shows on Amazon.com, and not in the UK. If anyone figures this out, I’d love to know what’s going on! Occasionally I check and don’t see any ratings. I think Amazon is testing things out.